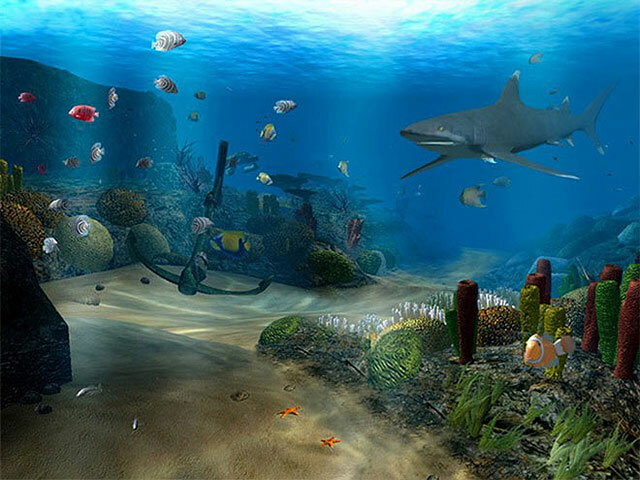 ﻿ Ocean Dive 3D Screensaver – Explore the bottom of the ocean yourself! Office workers are cunning folks: they have to hide their passion for such way of spending time as computer games. Strictly speaking, there is nothing blameworthy about it – intense work with documents requires rest or it will generate a lot of mistakes. Unfortunately, bosses do not get it (or pretend that they do not get it). As a result, an office worker caught red-handed risks losing his or her job. 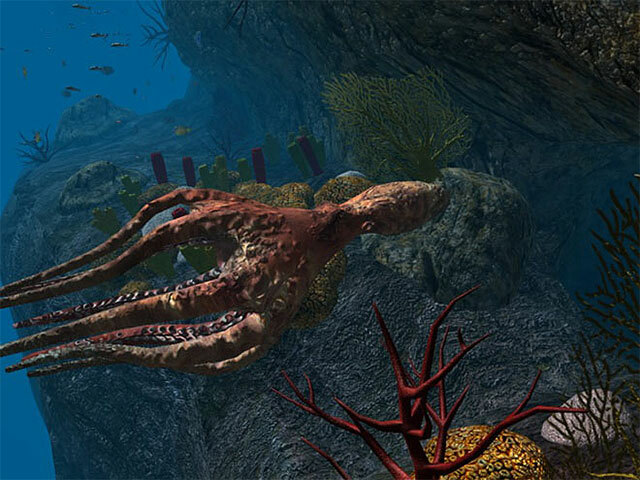 The Ocean Dive 3D screensaver is a perfect opportunity to kill two birds with one stone: enjoy magnificent landscapes of the ocean floor or switch to the quest game mode when you yourself choose where to go in order to explore a fascinating coral reef or to examine the seabed near a sunken Roman galleon. Anyway, this popular moving 3D screensaver will not leave anyone indifferent even without the game mode. There is no more need to go to an aquarium in order to study the flora and fauna of the underwater tropics – all this beauty will now be a step (literally) away from you. The realistic 3D models of creatures living in the sea depths: from the gorgeous clownfish to the magnificent shark, from the cunning octopus to the gorgeous ray, their habits and hunting methods, underwater canyons amazing in their beauty and grottoes attracting with their hidden mysteries – all this diversity of ocean depths will allow you to turn into an ichthyology expert in no time. We are sure that the Ocean Dive animated screensaver will become a real object of interest not only on your desktop, but in the entire office. The excellent realistic look of the picture is achieved due to the use of modern shader technologies. As a bonus in the game mode, the screensaver offers you the opportunity to explore new territories unavailable in the static mode.